American radio astronomy satellite. Radio Astronomy satellite operated by NASA, USA. Launched 1968. AKA: Radio Astronomy Explorer. Status: Operational 1968. First Launch: 1968-07-04. Last Launch: 1973-06-10. Number: 2 . Gross mass: 190 kg (410 lb). Span: 4.60 m (15.00 ft). The Radio Astronomy Explorer investigated low frequency (long wave-length) radio emissions from the sun and its planets as well as galactic and extragalactic sources. The spacecraft had a mass of about 190 kg. It was equipped with a dipole antenna (36 m from tip to tip) and two V-shaped antennas. These antennas consist of four 230 m long elements which form a large "X" with the spacecraft in the center. The V-shaped antennas provided gravity gradient stabilization. The RAE program, as planned, called for a series of four spacecraft with the first scheduled for launch in early 1968. Two missions (RAE-A and B) were approved and payloads for them were selected. Missions RAE-C, and D were not approved. RAE-A and B were intended for a circular orbit with an altitude of 5800 km. Inclination of the orbit to the equator was 58 degrees retrograde and the orbital period was 3.83 hours. 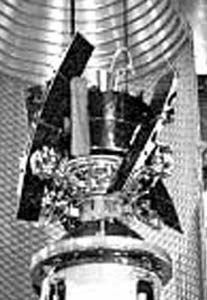 The RAE-1 spacecraft measured the intensity of celestial radio sources, particularly the sun, as a function of time, direction, and frequency (0.2 to 20 MHz). The spacecraft was gravity gradient oriented. The spacecraft weight was 193 kg, and average power consumption was 25 W. It carried two 750-ft-long V-antennas, one facing toward the earth and one facing away from the earth. A 120-ft-long dipole antenna was oriented tangentially with respect to the earth's surface. The spacecraft was also equipped with one 136-MHz telemetry turnstile. The onboard experiments consisted of four step-frequency Ryle-Vonberg radiometers operating from 0.45 to 9.18 MHz, two multichannel total power radiometers operating from 0.2 to 5.4 MHz, one step frequency V-antenna impedance probe operating from 0.24 to 7.86 MHz, and one dipole antenna capacitance probe operating from 0.25 to 2.2 MHz. RAE-1 was designed for a 1-year minimum operating lifetime. The spaecraft tape recorder performance began to deteriorate after 2 months in orbit. In spite of several cases of instrument malfunction, good data were obtained on all three antenna systems. For more details, see R. R. Weber, J. K. Alexander, and R. G. Stone, Radio Sci., v. 6, p. 1085, 1971. 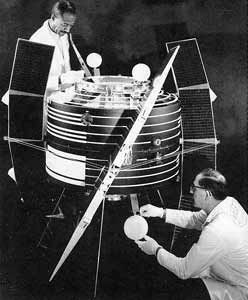 The Radio Astronomy Explorer B (RAE-B) mission was the second of a pair of RAE satellites. It was placed into lunar orbit to provide radio astronomical measurements of the planets, the sun, and the galaxy over the frequency range of 25 kHz to 13.1 MHz. The experiment complement consisted of two Ryle-Vonberg radiometers (nine channels each), three swept-frequency burst receivers (32 channels each), and an impedance probe for calibration. The experiment antennas consisted of travelling wave antennas forming an X configuration: a 229-m upper V-antenna pointed away from the moon; a 229-m lower V-antenna pointed toward the moon; and a 37-m dipole antenna parallel to the lunar surface. There was also a 129-m boron libration damper boom system used to damp out any spacecraft oscillations about the equilibrium position. The spacecraft body had a mass of 328 kg at launch and 200 kg in lunar orbit, and was a truncated cylinder 92 cm in diameter and approximately 79 cm high, with four fixed solar paddles. The maneuvering system consisted of a hydrazine velocity correction package, a cold gas attitude control system, and a solid fuel lunar insertion motor. Data were returned to the earth via either a low power UHF/(400 MHz) transmitter, in real time, or stored in an onboard tape recorder and transmitted to earth via a high power UHF transmitter (400 MHz). Two tape recorders provided backup storage. A VHF transmitter served primarily for range and range-rate measurements and as a backup. Commands were received on a VHF (148 MHz) receiver, which also was a part of the range and range-rate system. Spacecraft attitude was determined by (1) a solar aspect system, (2) a horizon sensor system, and (3) a panoramic attitude sensor system, and was accurate to 1 deg. The spacecraft was gravity gradient oriented (Z axis parallel to local vertical). 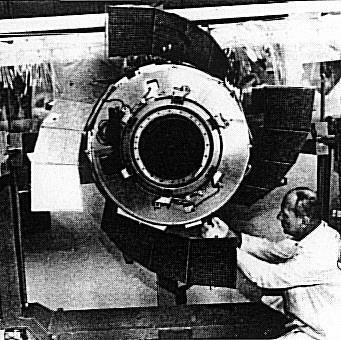 RAE-B was placed into lunar orbit on 15 June 1973 after a 20 second firing of the orbit insertion motor, and began operations on 20 June 1973. Initially only the 37-m dipole antenna was deployed, during which the spacecraft was operated in a 4-rpm spin-stabilized mode with the spin axis in the ecliptic plane normal to the spacecraft-Sun line. After three weeks the dipole booms were retracted, the spacecraft reoriented, the long-V antennas and libration damper were extended, and the dipole was redeployed. The lower V-antenna was initially extended to 183 m during the first 16 months of flight and was extended to its full 229-m length in November 1974. The lunar orbit and position of the Earth as a radio source imposed periodicities on the observations of 29.5 days (the lunar synodic month) and 24.8 hours (the interval between consecutive sweeps of a given Earth geographic position past the Moon. For additional information, see J. K. Alexander et al., Astron. & Astrophys., v. 40, p. 365, 1975. Royal Aerospace Establishment Royal Aerospace Establishment, British agency overseeing development of aircraft, rockets and spacecraft. RAE B Radio Astronomy satellite operated by NASA, USA. Launched 1973. Family: Astronomy, Medium earth orbit, Radio astronomy satellite. Country: USA. Engines: Star 17. Launch Vehicles: Thor, Delta, Thor Delta J, Delta 1913, Delta 1000. Projects: Explorer. Launch Sites: Cape Canaveral, Vandenberg, Cape Canaveral LC17B, Vandenberg SLC2E. Agency: NASA. Bibliography: 2, 3732, 405, 6, 11669, 13006, 13007. 1973 June 10 - . 14:13 GMT - . Launch Site: Cape Canaveral. Launch Complex: Cape Canaveral LC17B. LV Family: Thor. Launch Vehicle: Delta 1913. Explorer 49 - . Payload: RAE B. Mass: 328 kg (723 lb). Nation: USA. Agency: NASA Greenbelt. Program: Explorer. Class: Astronomy. Type: X-ray astronomy satellite. Spacecraft: RAE. USAF Sat Cat: 6686 . COSPAR: 1973-039A. Radio Astronomy Explorer; measured galactic, stellar radio noise. Lunar Orbit (Selenocentric). Spacecraft engaged in research and exploration of the upper atmosphere or outer space (US Cat B)..